I spotted this, umm, contraption on a classic motorcycle sales website. 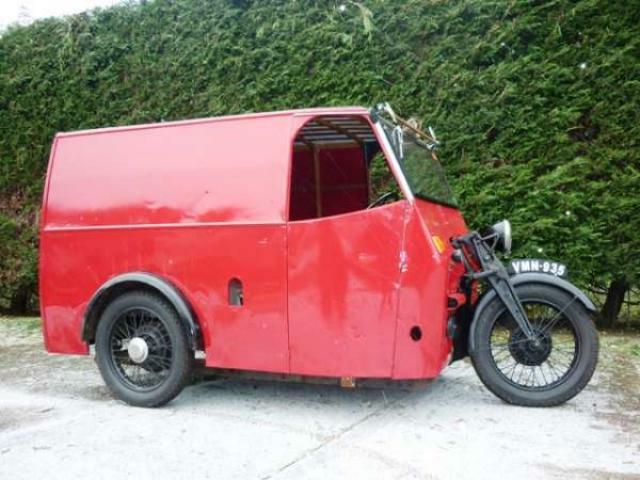 Here's what the ad says: nice period V Twin Van which has been opart of Andy's collection for the past 18 months (the intentions were to sign write it to compliment the James Handy Van which Andy also owns) Space is now forcing a reluctant sale. The Van was purchased ion the Isle of Man (see copy of the logbook and previous owners discription) she was driven to the Ferry and ran nicely but not used in the last 18 months so will need a new battery. Note she is still recorded on the DVLA system under reg marque ESJ 934 with the year of manufacture shown as 1935.